"Provianten" is the Danish word for the harbour-shops, which traditionally supplied food to the ships and sailors. 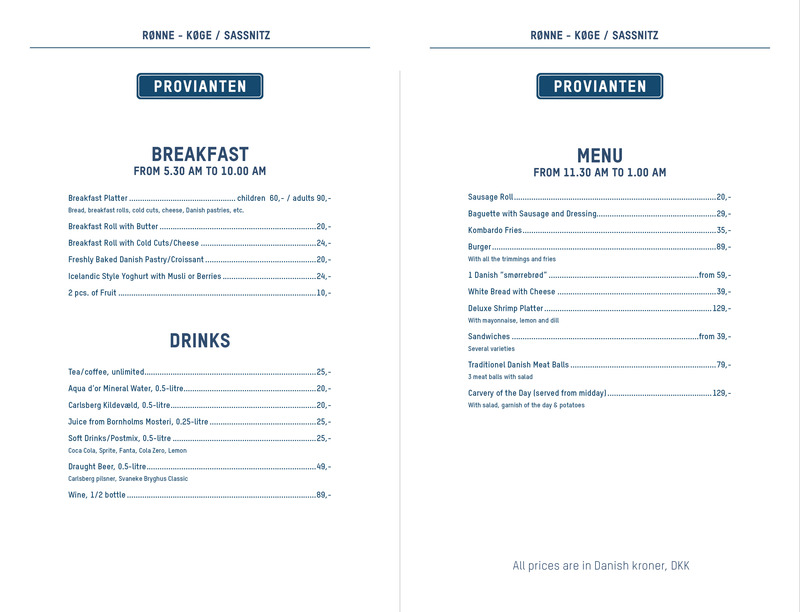 Nowadays, in Provianten on board the BORNHOLMSLINJEN ferries, you will find a wide array of light meals, snacks and beverages around the clock. Feeling hungry? 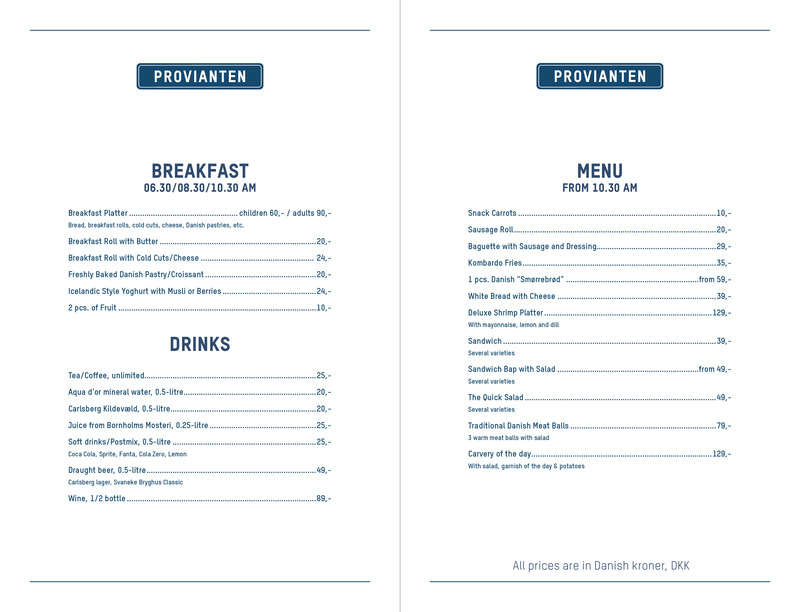 Try our classic homestyle burger, or how about endulging in world famous traditional Danish "Smørrebrød"? If you are more in the mood for a light meal , you'll find both healthy and sweet snacks to choose from. Danes have a special love for coffee and their consumption of coffee outranks almost all other nations on Earth. You may benefit from this passion in Espresso House - the coffee shop on board the high-speed ferries. Behold the beautiful view of Baltic Sea while enjoying a meal from Provianten on board Hammershus. From the early morning until late at night you'll find food, sweets and beverages for travellers of all ages. True to our Scandinavian heritage, let us tempt you with an absolutely delicious Shrimp-smørrebrød plate, and for you meatlovers, how about trying our king-size homestyle burger ? If your cravings are more of a light or sweet kind, coffee, softice and candy awaits you i Provianten. Do you have a cat or dog with you? Dogs and cats are welcome in the areas marked “dog areas” in the passenger areas - they just have to be on a leash or in suitable travel boxes. However, too many animals can be a stressful experience on board a ship with a lot of people. Therefore, it may be an advantage to consider letting your pet stay in your car during the crossing. Are you travelling with a dog or cat via Sweden? Please remember to report the importation of pets to the Swedish customs authorities at tullverket.se. You can read more about the rules for travelling with pets at foedevarestyrelsen.dk. Please note that the authorities make regular checks of travellers to and from Bornholm. Therefore, it is important to remember your passport or, possibly, other identification for the journey.